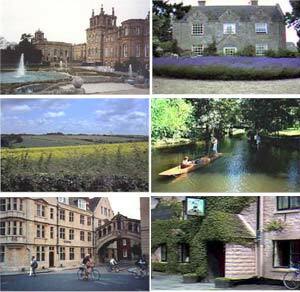 Cotswolds in central England, covering an area bounded by Oxford, Stratford, Cheltenham and Bath. Where is the area in Great Britain? Where in UK? Given that many of the visitors to Broadway are staying at the Lygon Arms, it is perhaps not surprising that the antique shops grouped along the main street here, are aimed at the top of the market. A large number of antique shops, mainly grouped around the square.